A Break from my Break! This “blog” idea was planted by a friend nearly five years ago. I am not technologically savvy… So, without my husband’s encouragement and technical support, I would not have taken the easy steps to start a Word Press site. Yet here we are, with four years worth of weekly posts behind me, when this exact same friend suggests I put my posts into a book. “Great idea!” I said to her. But I knew – I would never exert the time and energy required to figure out how to create a book! I casually mention it to my husband, and then forget about it. Months pass. Last Sunday afternoon I stand in my kitchen and my husband unceremoniously hands me an Amazon package. I reach into the padded envelope and pull out this small, green book. I see a picture which I took spread across the cover. I see my name in big font. I flip through the pages… my writing, my pictures. It’s my blog – in a book!! My husband spent months copying and formatting each weekly post into a document to be published and printed through Amazon. I am amazed at his dedication – and his ability to keep a secret! There are four separate books, one for each year I’ve been writing. Hours upon hours of my passion, study and faithful reflection held in my hand! It was surreal – I was speechless! My writing has been more for me than for anyone else – a commitment to my personal faith journey. But I realize more and more that it is bigger than that. Over the years, my writing has allowed me to have conversations about faith in ways I did not expect, with people I did not expect. It has helped me to build deeper relationships and connect with people in new ways. I get to share how God is at work in my life – but I also get to see how God works through a silly little writing shared by an average working wife and mom. There are people in my life who support me beyond what I could dream. When you find people in your life who support, encourage, and build you up – cling to them! These people are a blessing from God! My husband… I am a better person because of his faith, and his role in my life and the life of our family. My kids amaze me daily – their willingness to share their own beliefs and faith are an inspiration to me. To my dear, dear family and friends who continue to support and encourage me to write – thank you! Thank you for being such an important part of my faith journey, and for helping me see God at work in this crazy world. To Karen – thank you for planting this blog idea in my head! I sincerely believe you were a conduit for God’s voice directly to my soul!! 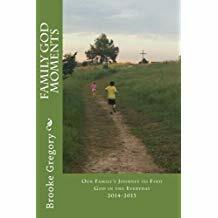 Categories: Ministry | Tags: author, books, faith, family, relationship, support, writing | Permalink. I was just thinking about this a few days ago and wondering if you had ever taken any steps with the book idea. Amazing and wonderful! So glad you said “My writing has been more for me than for anyone else – a commitment to my personal faith journey.” It’s hard for others to understand, but that’s how I feel about writing too!